Taken from the history of Carver Yachts, "In 1954 in a Milwaukee garage, Charles Carter and George Verhagen began building mahogany-planked, high-speed runabouts. Word quickly spread and combining the first three letters of their last names, the Carver Boat Company and the Carver brand was born." "The Carver aft cabin style motor yacht was first introduced during … (the 1980's) and became synonymous with the Carver brand. The 1990's also witnessed the introduction of the elegant and upscale Voyager long range cruiser series." Located in Pulaski, Wisconsin for many years now, Carver offers seven models for 2012 from its 36 foot Super Sport and Mariner yachts up to this newest and largest offering in the Carver line-up, the 54 Voyager. "The new Carver 54V is built on the proven and popular Voyager Series platform. 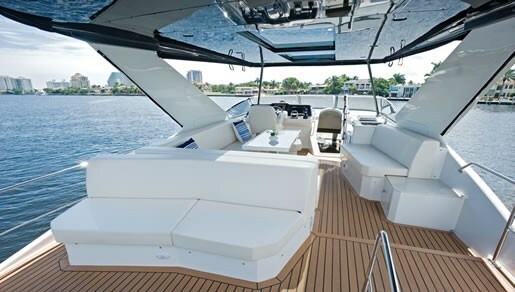 The yacht's eye catching profile is configured as a true pilot house yacht, incorporating a spacious extended fly bridge, lower helm and highly functional salon and cockpit." And this newest Voyager upholds the model's tradition as a long range cruiser. From its over 56-foot overall length and over 15-foot beam, the one-level cockpit extends through curved glass sedan doors to the spacious and luxuriously appointed salon. 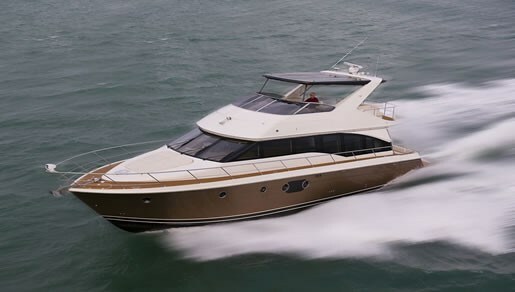 From the convenient raised lower helm with galley, to the massive flybridge with extended hardtop and full enclosure that spans over half the yacht's overall length, to the three stateroom design plus two heads and sufficient fresh water, holding tank and fuel capacity, its owners can truly travel far and wide without touching land if so desired. 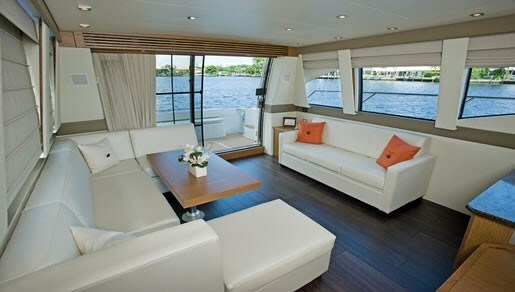 Spacious relaxing, entertaining, and ease of liveaboardability seem to be the touchstones of the 54 Voyager. The salon features a starboard side U-shaped convertible lounge with solid wood-top, aluminum pedestal, hi-lo table facing a portside 2-seater sofa. Lots of comfortable seating here for everyone. Salon entertainment is provided by a standard 32" Solé® LCD TV plus a Sony® 5-disc DVD/CD changer plus a Sony® stereo system with Sirius® satellite radio system and Apple iPod® dock. A salon wetbar with sink is standard as is specific stemware storage. The pilot house (lower helm), in true Carver tradition, is located forward of the salon and up a couple of stairs to provide a commanding view all around. The windshield comes complete with defoggers and three pulse wipers each with fresh water washers. 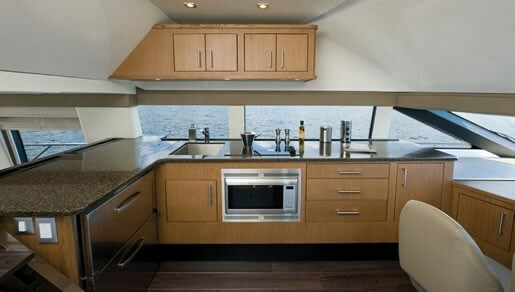 The pilot house space is shared with an L-shaped galley which also enjoys the same incredible view. It is equipped with solid surface countertops, designer décor, dark patina wood flooring, microwave, three-burner smooth top range and drawer-type refrigerator and freezer. Add a dishwasher and 12-bottle wine cooler if you like. If you don't want a lower helm, an L-shaped lounge with table is available in its place. A starboard side companionway off the salon with a side-deck access door leads six steps down to a centre isle off which are located the three staterooms. 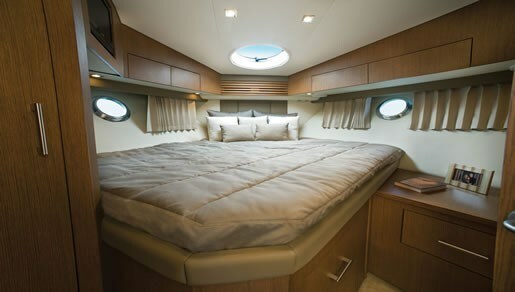 Immediately to the left and aft is the full-beam master with oversized queen pillowtop innersprung island bed with two end tables, integral dresser, two hanging lockers, and four opening screened portlights coupled with fixed hull glass. The large private master head features a separate shower stall with a bench seat molded into the full fiberglass lined tub. The forward VIP stateroom offers a queen island berth angled to port with two hanging lockers and private access to the guest head with its own separate shower stall with molded in bench seat. The portside guest stateroom offers twin upper and lower bunk berths. The "Low Profile Command Bridge" is exactly that and is accessed from inside via the pilot house, or on the outside via a cockpit ladder. The portside helm with swivel pedestal helm seat with arm rests is positioned almost mid-ship and faces a molded fiberglass dash with leather accents. Digital LCD engine instrumentation and diagnostics displays add analog minor function gauges. 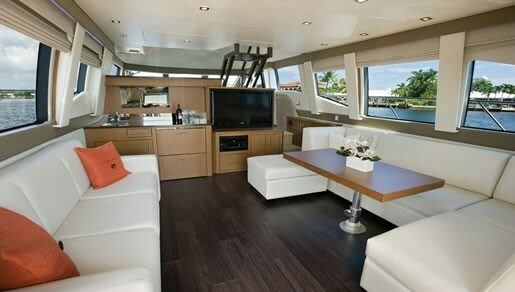 A starboard side wet bar with a couch faces a large U-shaped lounge with table. Another long couch is available on the bridge extension above the cockpit. Once again, seating here for everyone. "By the late 1990s, all Carver Yachts were constructed with no structural wood below the waterline, fiberglass stringers…" The new 54 Voyager is no exception. Standard inboard power is twin Volvo Penta® D9, 500 hp diesels with EVC (Electronic Vessel Control). Upgraded 575 hp Volvo Penta® or Cat® diesels are available. Add the Carver Docking System or Xenta Systems Joystick Docking System. A 15.5 kW Kohler® generator is standard or move up to the 23 kW version. A wide selection of navigation electronics and aids is available to tailor to your boating preferences as are many choices of comfort and amenity upgrades, most of which will help make your long range cruising in the Carver 54 Voyager just that much more enjoyable.